Brain Stimulation refers to a an emerging new discipline in psychiatry focused on the use of emerging electromagnetic means of modulating brain function to study and treat psychiatric disorders. These techniques use magnetic fields, and in some cases electrical fields, to stimulate the circuits in the brain that underlie major psychiatric disorders. This stimulation causes the neurons to fire and release the brain’s own endogenous neurotransmitters. Repeated stimulation can modulate or “reset” the firing rates of specific regions of the brain to exert lasting changes and to normalize the functioning of the circuit. Recent developments in biomedical engineering now allow us to directly and noninvasively affect the functioning of the brain using electromagnetic fields. The ability to target specific brain structures and stimulate them from the outside of the scalp, painlessly, has opened for the first time the potential to probe directly the circuitry underlying psychiatric disorders in vivo. By probing this circuitry we can reach a better understanding of the mechanisms underlying psychiatric disorders. That understanding will ultimately point the way towards more targeted therapeutic strategies. Unlike neuroimaging, which merely records brain function, brain stimulation can actually change brain function. 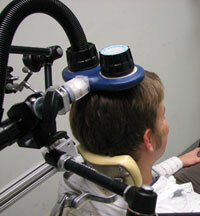 As such, it is a tool for treatment that can be targeted to the specific neural circuitry underlying the disorder. This focality and spatial specificity is impossible to achieve with any other treatment modality. Medications are important mainstays in psychiatric treatment, but in addition to correcting brain chemistry, they circulate through the bloodstream and cause unintended side effects in other parts of the body that can interfere with treatment. In addition to causing systemic side effects, medications are not effective for a disturbing proportion of individuals with severe illness. Specifically, it is estimated that 8.5 million Americans have treatment resistant depression. There is a pressing need to develop treatments for these severely disabling medication resistant disorders. Electroconvulsive therapy (ECT) is our most powerful treatment for medication resistant disorders. However, ECT affects large regions of the brain, some of which are important for recovery, but others of which cause serious side effects. Therefore, there is a need to develop more refined ways of stimulating the brain noninvasively to enhance the efficacy of our treatments and to make them more tolerable. New developments in Brain Stimulation are designed to meet that need.